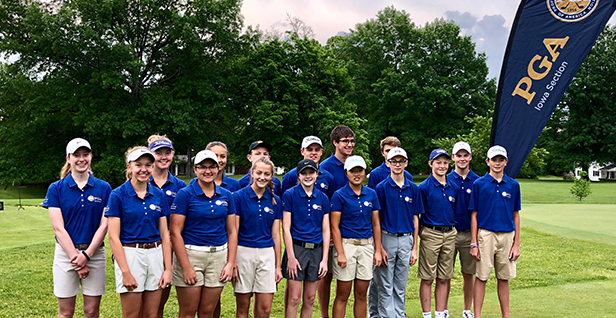 Burlington, Iowa -- The Iowa PGA Junior Cup Matches team fell to the Gateway PGA Junior team 24-7 in the 4th Annual Cobra Puma Junior Cup Matches over the weekend at the Burlington Golf Club. The team of Nile Petersen and Matthew Briggs claimed Iowa’s only match on Saturday winning their fourball match. The duo defeated Kegan Niles and Tyler Linenbroker 1up. Iowa halved two other matches on Saturday. The Iowa PGA Junior team won five singles matches on Sunday. Petersen claimed his second point of the weekend defeating Linenbroker 2&1 in singles matches. Rylee Heryford, Jared Tigges, Taylor Sedivec and Jenna Krogulski all won their singles matches as well. Heryford defeated Ella Overstreet 2up and Sedivec and Krogulski each won their matches 1up. Tigges defeated Hyatt Hines 8&6 giving Iowa it’s five singles points. Special thanks to Cobra-Puma for their continued support of the Junior Cup Matches and Joe Butler, PGA of Burlington Golf Club for hosting this year’s event. The Junior and Pee Wee Tour Kickoff is the next event on the Iowa PGA Junior Tour schedule. This event takes place Monday, June 4 at the Edmundson Golf Course and the Harvest Point Golf Course.